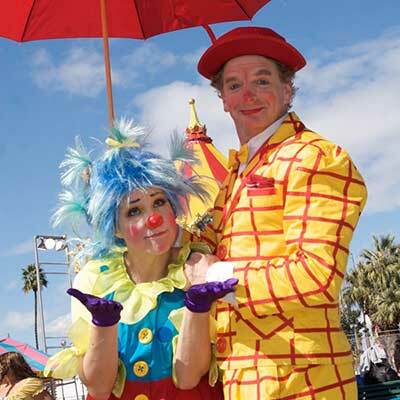 The Jumbo Shrimp Circus is Los Angeles’ premiere family entertainment variety arts company. Since 1994, we have produced our own shows and themed strolling entertainment in theatres, at festivals, film premieres, schools, libraries and malls. Our clients include Disney Films, Disneyland, Amgen, Fox Television Network, Westfield Shopping Centers, Caruso Affiliated Properties, the Canoga Park Improvement District, The cities of Burbank, Los Angeles, Beverly Hills, Long Beach, Fontana, Palm Springs, The Riverside County Fair, The Amador County Fair and the Motherlode Fair. 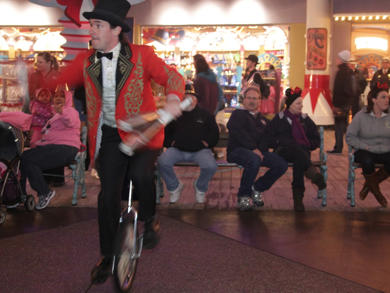 We have performed Across America and around the world and look forward to bringing a little circus into your life! Moxie and Epoxie are two great clowns out to create a great time. Their shows, teaching workshops and strolling entertainment are all interactive, exciting and fun. Kids and adults learn valuable lessons in balance, coordination and cooperation as life skills that they can carry with them beyond the brief encounter. They focus on being gentle clowns with child friendly aesthetic. Preserving the innocence and sincerity of childhood is their goal. Treating all of our audience with respect is their method. They have been a part of the Burbank Library’s summer reading program for so long now that some of our early fans are bringing their kids to our performances! Jumbo Shrimp Circus is the wonderful husband and Wife team (with occasional guest appearances by their adorable sons) of Philip and Heide Briggs. Their alter egos, Epoxie and Moxie are fun, charming and very entertaining.